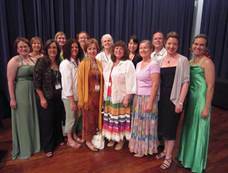 The American Harp Society in Dallas is proud and honored to have been selected as the AHS Chapter of the Year 2012. Our chapter has a long history, having been founded by Julia Louise Herrmann Edwards in April of 1963. We will be celebrating our 50th anniversary in April, 2013! The most significant accomplishment of our year began with the privilege of helping to host the AHS 9th Summer Institute 2011, and the 19th National Competition at the University of North Texas in Denton, under the awesomely-able leadership of Dr. Jaymee Haefner, head of the UNT Harp Department. After two years of careful planning, Jaymee and her committee, made up of members of the AHS in Dallas Chapter, had designed an exciting and memorable event. For our chapter, it meant the utilization of the skills of most of our chapter members in every aspect of the Institute—from performers, to workshop presenters, to student ensembles, to historical power point creators, to volunteers who helped in all areas of need. We were exhausted afterwards, but truly elated with our efforts. 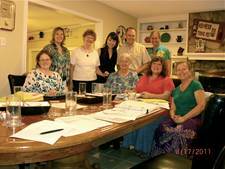 The AHS in Dallas Chapter has a strong focus on students, being represented by approximately 20 member teachers. We have established three student competitions which have been ongoing for many years. The two performing competitions run on a carefully set schedule, with Auditions and Evaluations separating each one. The other is held every other year. In February 2012, we presented a very formal AHS Scholarship Tea at a beautiful restored mansion in Dallas. Members of AHS in Dallas and many community members were invited to an afternoon of harp music, including an opening reception, (where students played background music), a stunning recital by UNT harp student, Ann McLaughlin, and afterwards a High Tea, with all food and flowers donated by Central Market. This afternoon of harp music not only brought harpists and members of the community together to enjoy the beauty of the harp, but was also a way to receive donations to be able to continue our competitions. 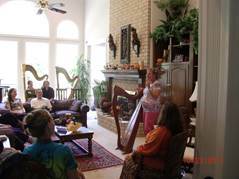 Other meetings this year included a program by Celtic harpist, singer, and songwriter, Martha Gallagher from New York, and a Teacher’s Forum, led by harp teachers for the benefit of teachers and students alike. The last meeting of the year was the Annual Student Recital, which, for the past 48 years, has been held on the first Sunday in May. This year 27 students and 7 teaching studios were represented. As President of the AHS in Dallas, I admire this amazing group of people who make up the members and Board of Directors of AHS in Dallas. They are not only highly dedicated to the cause of the harp, but also work together to learn from each other and support each other in every way.